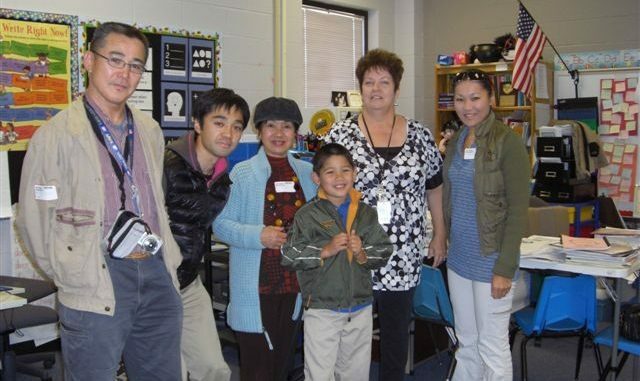 NEW SARPY – Mani Schmidt, a third grade student at New Sarpy Elementary enjoyed showing his grandparents and his uncle around his school during their recent visit from Japan. Mani’s grandparents and uncle were visiting Destrehan for five days. His grandmother, who works at an elementary school in Japan enjoyed meeting Mani’s teacher, Mrs. Netta Stevens, and seeing his classroom, the school library, cafeteria and outside play areas. Pictured from left to right are Mani’s grandfather, his uncle, his grandmother, Mrs. Stevens, and his mother Mrs. Kuniyo Schmidt.